The American Adventure pavilion and show are our choice for #Day68 in our #DisneyWorldCountdown. This pavilion is directly opposite the main entrance to World Showcase, and has an incredible amount of activity bustling around it! For starters, this is the home of the Liberty Tree, one of the better counter service restaurants in Epcot in my opinion, where you can pick up standard American fare. Also, this pavilion is home to the Voices of Liberty that we featured in #Day75 of our countdown last Tuesday. An accompanying musical performance group, the Spirit of America Fife & Drum Corps, is also a main part of the pavilion. In the picture below you see them marching into place to perform for the Guests. 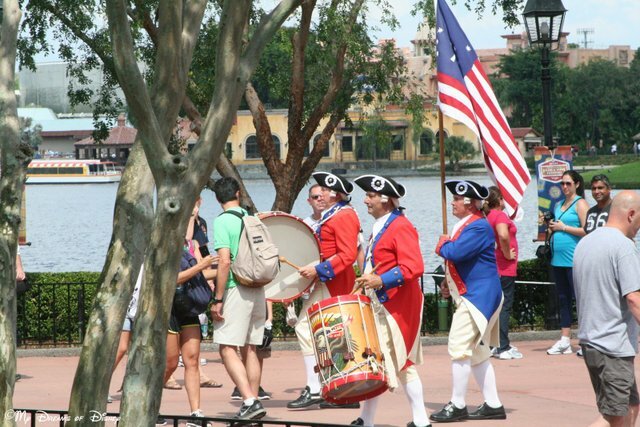 The Spirit of America Fife & Drum Corps are an integral part of the American Adventure pavilion! 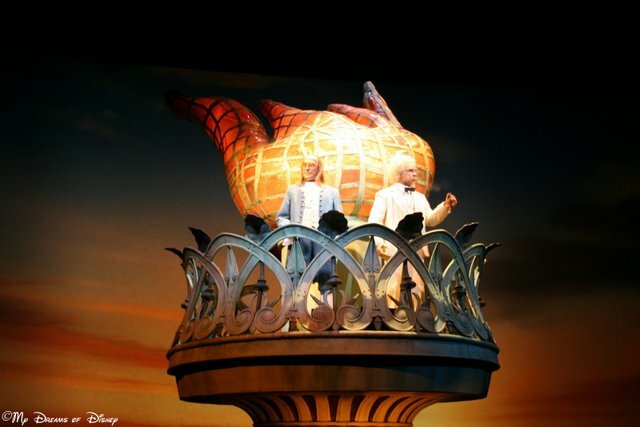 In addition to these great singing and performing bands, the America Garden Theatre is home to some of the best musical and narrated performances anywhere at Epcot. Each summer the theater is home to the Sounds Like Summer tribute band concert series, and of course, in the Christmas season they feature the Candlelight Processional that tells the Nativity story as narrated by some incredibly well known celebrities. But in my opinion, what really makes this pavilion stick is the American Adventure show featuring Mark Twain and Ben Franklin. This dynamic duo narrate the story of how America was shaped by it’s greatest natural resource — it’s people! I’m not sure why this is, but I think it is because I saw this in 1983 during my first trip to Epcot, before the America Garden Theatre existed, and it was truly the highlight back then of this pavilion. 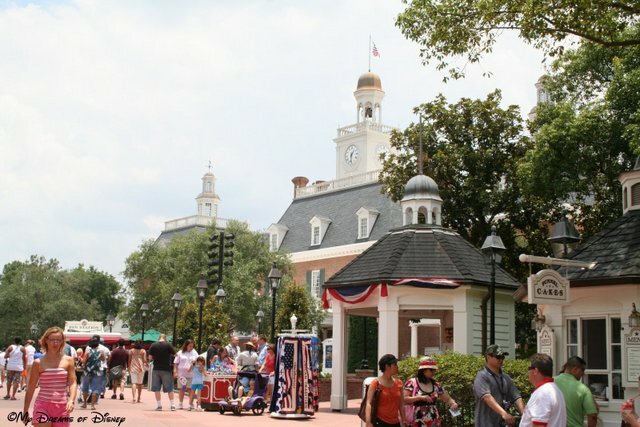 So tell me, what do you think of the American Adventure pavilion? Do you stop by each time or do you just pass through on your way to your next stop? Let me know in the comments, and thanks! Tiggerific Tuesday Trivia – Modesty! The American Adventure Show at Epcot! Previous Post: #DisneyTrivia: Pirates of the Caribbean!